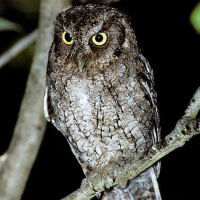 The Guatemalan Screech Owl is a medium-sized screech owl with small ear-tufts and yellow eyes. Greyish and red morphs are known to exist. It is also known as the Middle American Screech Owl. Typical call (A-song) - Lacandon, Chiapas, Mexico. May 2003. CC David Bradley. Typical call (B-song) - Sinaloa, Mexico. November 1999. CC Richard Hoyer. Description: Grey morph: The facial disc is greyish-brown with fine vermiculations. The rim around the disc consists of a fine row of distinct blackish spots. Eyebrows are whitish, and eyes are yellow. Bill and cere are greenish. Ear-tufts are short, pointed and relatively dark. The crown is similar to the back, but blackish markings are broad and prominent on the upper edges of feathers, giving a lightly barred appearance. The hind neck has a pale border that is not prominent. Upperparts are dark greyish-brown with blackish shaft-streaks, cross-bars, flecks and vermiculations. Scapulars with blackish-edged whitish outer webs, forming a whitish row across the shoulder. Flight and tail feathers are barred dark. The general colour of the underparts is paler than the upperparts, with blackish shaft-streaks and cross-bars. The upper breast has brownish vermiculations, with fewer or none on lower areas. Throat is whitish. Tarsi are feathered to the base of the toes, which are bare and dusky-flesh in colour. Claws are horn with darker tips. Red morph: Generally rufous with patterns similar to the grey morph, but with the dark patterns less prominent. Size: Length 20-23cm. Wing length 152-178mm. Tail length 68-94mm. Weight 91-123g. 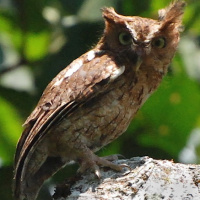 Habits: The Guatemalan Screech Owl is Nocturnal, hiding in dense foliage or tree cavities during the day. Rarely uses an open perch to sing, so is difficult to locate. Voice: The male's A-song is a long trilling series of 'u' notes, at 14 per second, which can last up to 20 seconds or so. This phrase is repeated after a pause of several seconds. The entire song starts softly, then increases gradually in volume and slightly in pitch before abruptly breaking off. The female has a similar, usually shorter song which is slightly higher in pitch and has a 'tinny' quality. The B-song is a short sequence of accelerating staccato notes with the rhythm not unlike a table-tennis ball bouncing on a hard surface - bup bup bup-bup-bupbupbupbupburrt. Again, the female has a similar higher-pitched call which is used in courtship duets with the male. 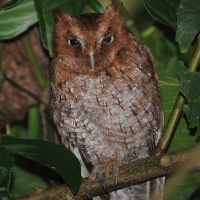 Hunting & Food: The Guatemalan Screech Owl feeds mainly on insects and larger arthropods. Occasionally takes small terrestrial vertebrates. Prey is caught by swooping on it from a perch, or in flight. Frequently hunts at forest edge or in clearings where it takes insects in flight. Insects are also taken from branches or from the ground. Breeding: Not well studied. Nests in natural tree cavities, especially woodpecker holes and knotholes. 2-3 white eggs are laid on the debris already in the hole. Habitat: Humid to semi-arid forest (evergreen or semi-deciduous) as well as dense scrubby woodland. Ranges from sea level up to about 1500m. 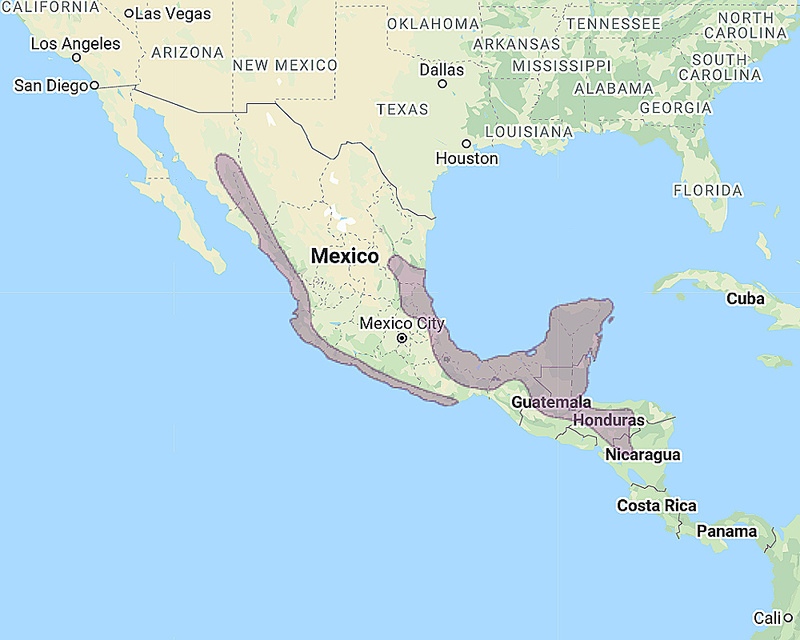 Distribution: Mexico, on the Pacific slope from South Sonora to Oaxaca, and on the Atlantic side from Tamauilipas south to Yucatán, Cozumel Island and East Chiapas. Also Belize, Guatemala, Honduras, Nicaragua and North Costa Rica. Original Description: Sharpe, Richard Bowdler. 1875. Catalogue of Birds in the British Museum (Cat. Birds Brit. Mus.) 2: p. 112, pl. 9.